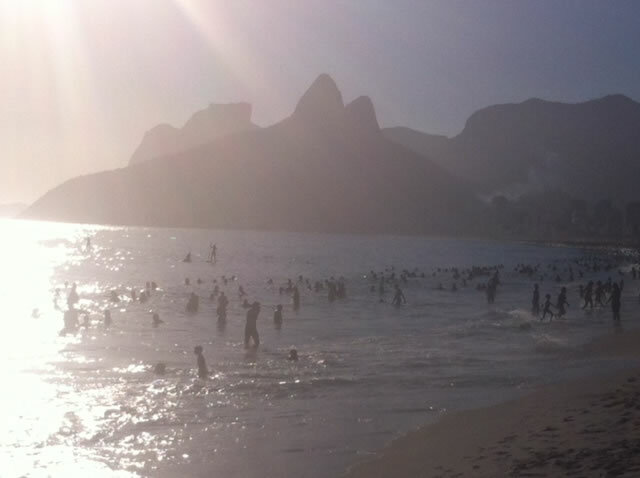 At the end of November 2014 I slipped off to Rio for 9 weeks of what should have been mainly holiday plus “a little bit of filming”. Rio became a wonderful work extravaganza teaching regular huge groups of skaters each week, and even a Rio ICP instructor course. The filming I had planned to accompany the series of Electronic Training Manuals that I wrote in 2014 ended up being a much larger project than I had anticipated. I filmed almost every day in January from 6am (28 degrees) till midday (38-41 degrees)! But it’s all “a wrap”! Great footage now being edited for your enjoyment later this year. On my last day of filming I injured my hip doing a Three Turn entry into backwards Powerslide on my weaker side which has allowed me to skate through February and March but which has me limping when I walk. I am now back in the UK resting and healing before I teach again later in April. 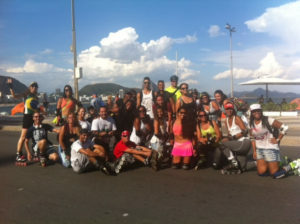 In February I left Rio for Miami and the Great EsSkate event. 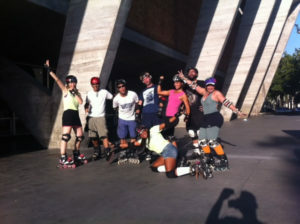 It was fabulous to meet the USA skate scene, I made lots of new friends and added to my “must visit in the US” list. Hoping to see some of the new faces again (perhaps for the Skatefresh Rio trip, in February 2016). I thoroughly enjoyed and appreciated the gift of a weekend in a penthouse suite on Miami Beach courtesy of a newly-made friend-of-a-friend on Facebook! In February I also landed a great new job in South America and Spain with a very large international TV production company filming a series involving young people skating. I am their Skating Consultant helping them with issues of Health and Safety, coaching actors, equipment, training schedules, hiring coaches, planning skate sequences, and having lots of bilingual Skype meetings in both Spanish and English. With the help of technology (and my new iphone-6) I am coaching the actors in South America via video instruction direct to the coaches on the ground. It is a very interesting new approach to teaching. I finished off my trip spending March in Spain doing ICP Level 1 and 2 instructor courses and teaching my longest-standing Spanish association – Gaubela in Vitoria. I am now back in Brighton, moving back into my flat, nurturing my hip with yoga and rest, healthy food and lots of sleep. I am looking forward to the summer season and will be doing my first Stroll in London on Sunday 19th April and hope to see many of you there.